One factor that drive the effectiveness and efficiency of keels, rudders and hydrofoils is the airfoil shape. If the airfoil shape is not suitable for the job then the design will not perform satisfactory. For example, let us take a look at a high performance keel. Here, an astute designer might investigate the use of a NACA 6-series airfoil for the cross-sectional shape. The reason for using this airfoil shape for the keel is, of course, the delay in transition from a laminar to turbulent boundary layer along the chord of the airfoil. In an ocean race, this is important because larger regions of laminar flows on the keel produces less overall friction drag or water resistance. Less drag wins races. But suppose the designer uses the same shape on the rudder, what do you think might happen? A possible side effect of using the 6-series airfoil might be loss of control. Why? The answer has to do with early separation (vs angle of attack) of 6-series airfoils. Knowing the behavior and use of airfoil shapes in the design of keels, rudders and hydrofoils is one advantage that the best marine designers utilize over their completion. Another, is the importance of three dimensions or 3D in a design. Yes, airfoil behavior is only the first part of a successful aero-hydrodynamic design. The knowledge of the performance of the design in 3-dimensions equips the designer with the exact size (width and length) and shape of winning keels, rudders and hydrofoils. Anyone can design a keel that is too large (an overwhelming amount of drag) or too small (not effective). However, the subtleties of the best designed planform shape that makes it a winning appendage is a closely held secret that is only divulged by accurate 3-dimensional analysis. 3DFoil/MultiSurface Aerodynamics is based on a novel numerical algorithm that couples the vortex lattice method (based on vortex rings) with a linear strength panel method. Together, these two methods compute accurate values of the lift, drag (both profile and vortex) and moments. 3DFoil buit-it wing design tool makes it very easy for users to accurately design and analyze hydrofoil models. The following video is a tutorial that shows the design and analysis of a L-foil. 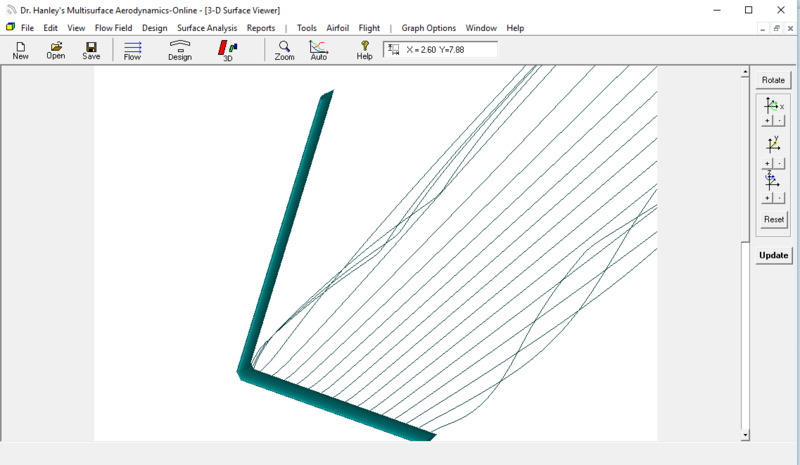 3DFoil enables designers to test airfoil shapes, planform designs and stability (longitudinal and lateral). The software is used to rapidly and accurately compute lift, drag, side force and lateral resistance for your designs. 3DFoil is the key to designing the most efficient and effective keels, rudders and hydrofoils. The software has been used over the last decade to train engineering students at the US Coast Guard Academy .